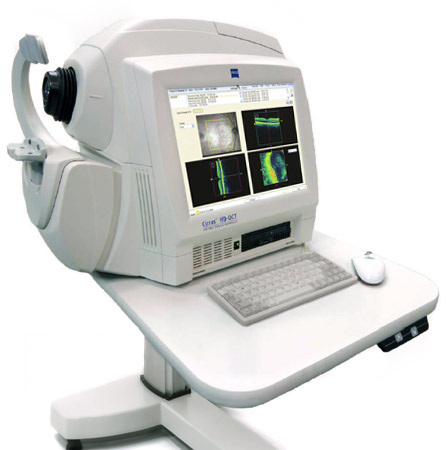 The Cirrus OCT incorporates optical coherence tomography technology to provide comprehensive imaging and measurement of glaucoma and retinal disease. Cirrus OCT is the gold standard in vivo imaging device for the posterior segment and offers proven reproducibility for disease management. The OCT provides real-time cross-sectional images and quantitative analysis of retinal features to optimize the diagnosis and monitoring of retinal disease and for enhanced pre- and post-therapy assessment. The device is beneficial for evaluation of cataract patients, pre- and post-operatively, and for the assessment of early signs of glaucoma and glaucomatous change.